For parents of kids with birthdays close to the cut-off date for kindergarten registration, the debate can start almost as soon as they’re born: Should we red-shirt him? Will she be ready for kindergarten that soon? Red-shirting, which was originally coined as a term for college athletes who were kept from competing for a year to improve their skills and extend their eligibility, is now often used to describe the act of keeping a child from starting kindergarten for an extra year. It’s most common with children who have summer birthdays or a birthday that falls very close to the school district’s cut-off date. 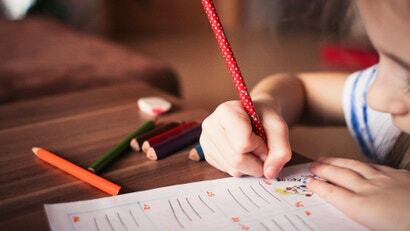 Whether it is truly at a child’s advantage to be “red-shirted” is up for debate; but now, a new study indicates that students born in August and who are among the youngest in their kindergarten classes are more likely to be diagnosed with ADHD. Reporter Jenny Anderson writes for Quartz about the study, which was published this week by Harvard Medical School researchers. Here’s how a child’s birthday can shape their experience in school: Imagine you live in a school district with a Sept. 1 cutoff, meaning your child has to be five years old by Sept. 1 in order to start school. This means that a boy named Lucas, who turned five on Aug. 15, will enroll in the same class as Jack, who will turn six on Sept. 15. Jack has been alive almost 20% longer than little Lucas. Developmentally, this is an eternity. He will likely have better self-control and be better equipped to do the things required in school, like sitting still and listening for long periods of time. “As children grow older, small differences in age equalise and dissipate over time, but behaviorally speaking, the difference between a 6-year-old and a 7-year-old could be quite pronounced,” said study senior author Anupam Jena, an associate professor of Health Care Policy in the Blavatnik Institute at Harvard Medical School. What is normal for a five-year-old stands out as immature for six-year-olds. The study found that, in districts with a Sept. 1 cutoff date, kids born in August were 34 per cent more likely than their almost-a-year-older September peers to receive a diagnosis of Attention Deficit Hyperactivity Disorder. ADHD symptoms can include hyperactivity, inattention, difficulty sitting still, lack of focus or an inability to follow directions. Personally speaking, my husband and I red-shirted our son. He has a late-September birthday and in our school district, the cut-off date is Oct. 1. The closer we got to the time when we had to make a decision, the clearer it was that he would not be ready — either academically or emotionally — to transition from two hours of preschool four days a week to full-day kindergarten a month before he even turned five years old. And his preschool teachers made it clear that they couldn’t have agreed more. Luckily, we had the option (and the financial means) to enter him into a preschool program specifically for kids in this situation; it was five days a week and more academically rigorous than the regular 4-year-old program (but less so than kindergarten). And even now, with my son thriving in second grade, I can’t imagine he would be thriving in third grade if we’d enrolled him a year earlier. But having a choice at all is a luxury many parents don’t have. Many parents can’t afford another year of daycare or preschool. And one parent in our Offspring Facebook Group felt forced into registering her son for kindergarten in order to keep a variety of educational services in place for him. “He was receiving preschool therapies through a school district program for some developmental delays (gross motor, fine motor, speech). Those therapies expire at age 5 with the assumption that your child then continues the therapies through the special school district,” says Jennifer, whose son turned five two weeks before the school district’s cut-off date of Aug. 1. Other parents in the Facebook group say they have—or still are—considering everything from a child’s social and academic skills to how their physical size compares to kids their age. Some parents factor in their personal experiences of being among the oldest or youngest when they were in school. Article needs to be de-Americanized. Ex lexicon-compiler writing here: "ize/yze" is not a purely American spelling and is for example, the preferred spelling of the OED. The -ise vs -ize national debate is something conjured up by a mix of prescriptivist Australian educators (snobbishness basically) and perpetuated by Australian dictionary sellers. I love how the diagnosis is ADHD when the article itself points out how a kid that's nearly a year younger is simply less developed and less capable of paying attention. So... it's not ADHD it's natural behaviour that will decrease in time and should not be medicated. Not saying no kid had ADHD, I'm sure some do. But diagnosing a 5 year old with ADHD seems very premature. Also got a laugh out of "red shirting". The first thing my mind went to was Star Trek. So the kids are expendable cannon fodder? Nice!